In my mind, Larry McMurtry is one of America's great novelists. He has an uncanny ability to craft very personal stories about the things that make us human while placing those intimate stories within a vast, sprawling setting, offering a new and different perspective on familiar places or events. His novel Lonesome Dove --as well as its subsequent television miniseries adaptation--sits near the top of my favorite westerns. A common theme in the author's work is surviving amid transition. Like The Last of the Mohicans, his characters are often out of time, feeling a sense of nostalgia for a way of life that won't soon exist. Buffalo Girls is no exception. Many of McMurty's westerns have been adapted for television as huge, epic miniseries events, so it was really only a matter of time before Buffalo Girls--first published as a novel in 1990--was crafted into a TV miniseries in 1995. The two-night television event places the focus on the women of the west who saw unimaginable beauty but braved unspeakable tragedy. Focusing on real people and events while taking significant artistic liberties with history, Buffalo Girls tells the story of Calamity Jane (Anjelica Huston, playing against type) and her best friend Dora DuFran (Melanie Griffith). Jane is a wild woman of the west, hard drinking, fast shooting, and no stranger to cattle drives and cross-country treks through the wilderness. Dora is a soft woman who has spent years as a woman of the night, but longs for a more success and stability. Though they're miles apart in temperament, they're the closest each other has to family. One of the strengths of the TV event lies in its ability to convey that intangible sense of longing and loneliness present in the McMurtry novel. We follow Calamity Jane from the vast open prairies of New Mexico to the dusty saloons of Deadwood and even to the bustling Victorian streets of London. The sense of location, of a particular time and place, is strong. The other big strength is the cast, which is filled with great actors. I've already mentioned Oscar-winner Anjelica Huston and Oscar-nominee Melanie Griffith, but we also get Gabriel Byrne (The Usual Suspects), western stalwart Sam Elliott (Road House), Peter Coyote (E.T. ), country singer Reba McEntire, Jack Palance (Batman), Tracy Walter (also Batman), Floyd "Red Crow" Westerman (Dances With Wolves), and Liev Schreiber (TV's Ray Donovan). Plot is rarely the focus of the stories penned by Larry McMurtry. The driving force behind Buffalo Girls is relationships: romantic relationships are represented through Jane's attraction to Wild Bill Hickock (Sam Elliott) or Dora's conflict with her lover (Gabriel Byrne). There's also a huge focus on friendship, represented by two beaver trappers (Jack Palance and Tracy Walter) who have witnessed the near extinction of the animal that once provided their livelihood. There's a relationship between white men and the Native Americans, as represented by a dignified character called "No Ears." The relationship between Calamity Jane and Dora--two women with very different backgrounds and lives, but a deep affection and understanding of each other--is the real focus of the story. Through it all, there's a sense of sadness. McMurtry's books have a way of making us feel nostalgic for a time and place none of us have seen. 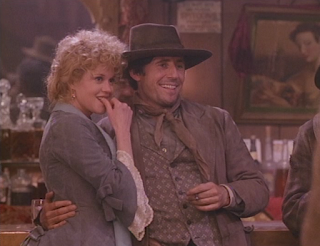 In Buffalo Girls (as in Lonesome Dove), the west is no longer lawless; those who explored and fought and rode across the open country have done their job, and the Wild West is no longer a frontier that needs exploring. 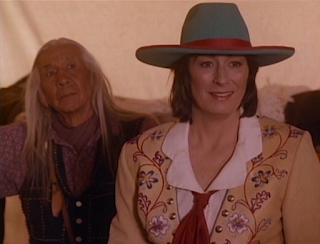 This sadness is often represented in Anjelica Huston's performance. Her Calamity Jane is brash and passionate, constantly dealing with heartbreak and disappointment in a way that seems outside of the actress's comfort zone. It's a bold performance, and one that I'm not entirely sure works. 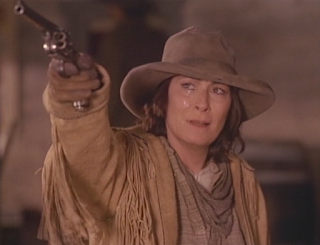 In all honestly, it sometimes seems that Huston is miscast, but I can't deny how much emotion she puts into the role. The biggest thing working against Buffalo Girls is the short running time. At only three hours, it's nearly impossible for the production to truly serve the many triumphs and tragedies of its characters. 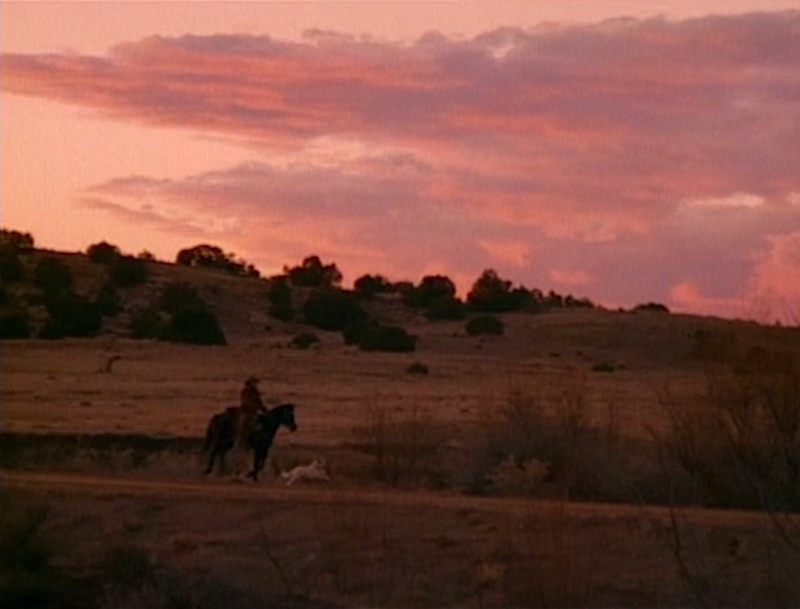 All of the other McMurty-based TV miniseries (Lonesome Dove, Return to Lonesome Dove, Comanche Moon, Dead Man's Walk) had between 4 1/2 to 6 1/2 hours to tell their stories, and even then were forced to cut vast sections of the novels out to make it fit. At just three hours, Buffalo Girls has to move so quickly to fit in the vignettes from the book that it can't really do justice to any of them. Characters grow ill and die in a matter of moments. We spend five minutes on a particular chapter and then break for a commercial, sometimes with years passing between scenes. There's no time to slow down and breathe or digest the events, and it's unfortunate that this look at the lives of the women who shaped the west didn't get enough time to properly tell the story. Screenwriter Cynthia Whitcomb and director Rod Hardy, both of whom have a long list of television credits, made the most out of the limited time that they were given. 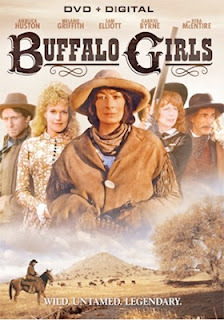 Still, when Buffalo Girls works, and it occasionally does, we find ourselves transported to another time and place. 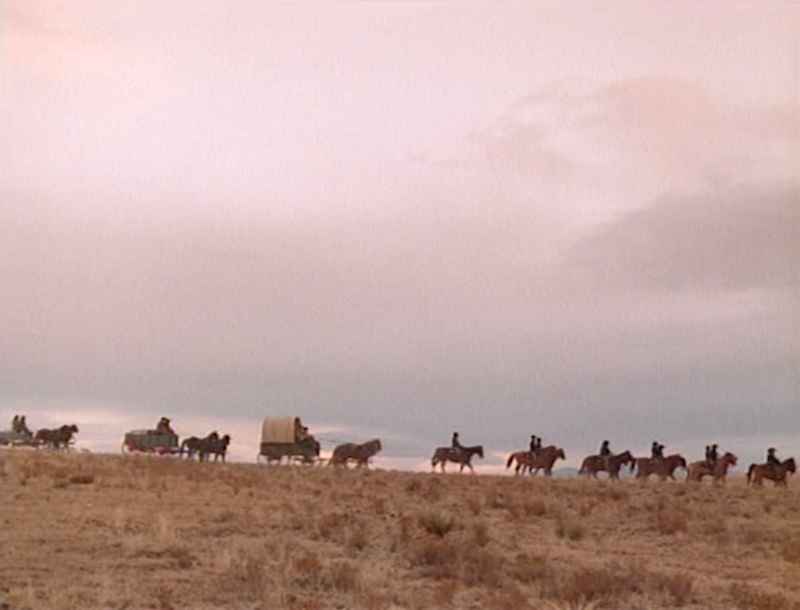 We get to ride with Calamity Jane, to travel with Buffalo Bill Cody, to mourn the passing of an era with those who survived it. Our characters aren't good or bad; they embody both admirable qualities as well as flaws. They make mistakes, act out of passion, and sometimes suffer for their decisions. The story ultimately humanizes larger than life personalities. Buffalo Girls is available on DVD from Mill Creek Entertainment. 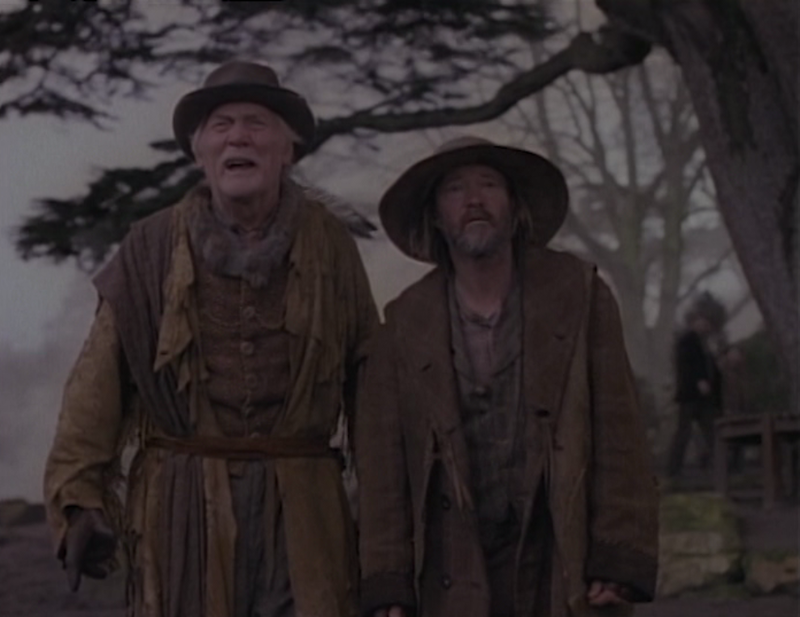 The full frame video presentation is true to its original aspect ratio and is quite soft, but this seems in line with mid-nineties TV productions. The story is presented in two parts, just as it aired on television in 1995. There are, thankfully, optional subtitles available, as well. There are no special features. A code to redeem a digital copy of the miniseries on Mill Creek's streaming service is included. 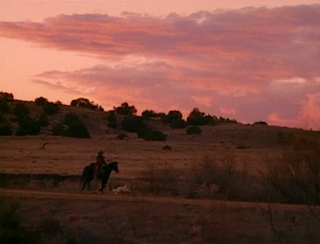 Shortcomings aside, Buffalo Girls is a fair adaptation of one of Larry McMurtry's less-acclaimed novels. 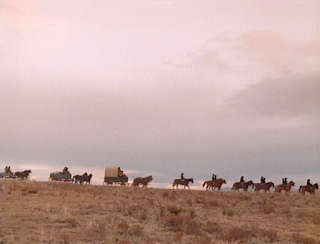 It presents us with three-dimensional characters, solid performances from a stellar cast, and an unflinching look at the lives of some of the west's most famous characters as they try, and sometimes fail, to adapt to changing times. 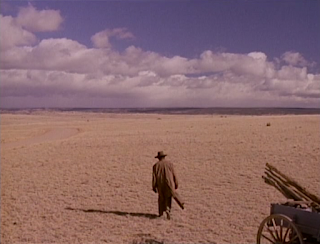 Fans of westerns will likely want this on their shelves.